Four months had passed since the Battle of Gettysburg, the reputed high-water mark of the Confederacy. President Abraham Lincoln was invited to speak at the dedication of the Soldiers’ National Cemetery in Gettysburg. His remarks were a work in progress on November 18, 1863, as he boarded his five-car train (draped in red, white and blue bunting) in Washington, D.C., for the four-hour ride to Gettysburg. Imagine Lincoln pondering his speech as his train rumbled north on the Northern Central Railway into York County, stopping at Hanover Junction to change trains to the Hanover Branch Railroad and continuing on to Gettysburg. Some say that Lincoln edited the Gettysburg Address on the train, doffing his black silk top hat and using it as an improvised desk on which to write. Or maybe he wrote on the back of an envelope. There is some sentiment that he simply shared anecdotes and relaxed with his companions, who included Secretary of State William H. Seward. What is certain is that what would become known as Lincoln’s Gettysburg Address is today considered one of the greatest speeches in American history. Lincoln’s journey to Gettysburg is one of the many exciting and intriguing York County connections to the Civil War that Steam into History will bring to life. Today, the rolling countryside along the old Northern Central route is relatively undeveloped – consistent with how the area would have appeared in the 1860s. The area’s unspoiled beauty belies the hub of purposeful activity that was Hanover Junction during the Civil War. The station saw as many as 30 train stops daily, as the Northern Central carried troops and supplies heading to Washington for service in the Army of the Potomac. After the Battle of Gettysburg, wounded soldiers were transported to hospitals in York and Baltimore. Seventeen months after the Gettysburg Address, Lincoln was slain. The Northern Central carried Lincoln’s funeral train through New Freedom and Hanover Junction, stopping in the city of York to take on water for the train’s boiler. 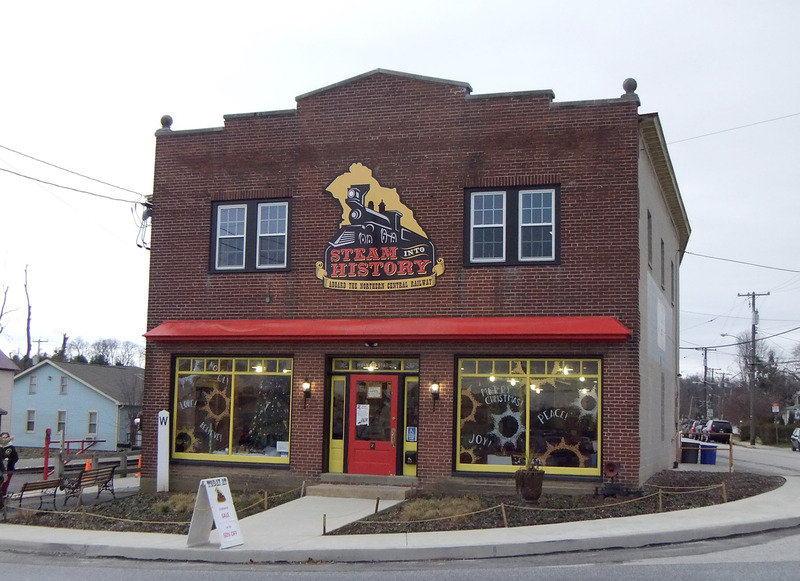 Steam Into History opened June of 2013. What Makes Steam Into History Different? Authenticity – Steam into History offers riders an authentic experience via a replica Civil War-era steam locomotive as well as a mid-20th century diesel locomotive. The trains follow along the historic Northern Central Railway, which was a critical railroad that helped enable the Union victory in the Civil War and played a major role in the Industrial Revolution, allowing for transportation of products to wide geographic markets. President Abraham Lincoln rode the NCRR to and from Gettysburg when delivering the Gettysburg Address, and his funeral train passed from Baltimore to York via the NCRR. Scenery – South-central Pennsylvania’s famed rolling hills frame the unique visual experience of Steam into History, which departs from the historic hamlet of New Freedom and visits places like Hanover Junction Rail Station (where Lincoln switched trains en route to Gettysburg) and captivating towns like Glen Rock. The world’s oldest rail tunnel with active rails, Howard Tunnel, lies along the NCRR tracks, and the nationally-recognized York County Heritage Rail Trail follows along the tracks, offering bikers, joggers, and walkers access to York City in the North and the Mason-Dixon Line in the South, where it connects with Hunt Valley, MD, via the 20-mile Northern Central Railroad Trail. York County is also known for its diverse architecture, evidenced by the 19th century houses, commercial buildings, and barns along the railroad. Themed Programs/ Rides – The past comes to life through Steam into History’s themed excursions, where you can meet President Abraham Lincoln, talk with Confederate General Robert E. Lee and his wife, experience a real-life Wild West raid from the James-Younger Gang, learn about the Underground Railroad from William Goodridge and more! Furthermore, special seasonal events like the hugely popular Tannenbaum Train and Fall Foliage Excursions offer unique family experiences aligned with the seasons I Where else can you ride a train to a Christmas Tree Farm, choose a tree, and have it waiting for you when you get back to the train station? Premium Equipment – The William H. Simpson No. 17 is an authentic replica of the steam locomotive that carried President Abraham Lincoln to deliver one of the greatest speeches in history, the Gettysburg Address. Steam into History also offers rides pulled by GP-10, an authentic 1957 diesel engine that was a workhorse for the Pennsylvania Railroad. Lovingly restored rolling stock, including a unique combine car, creates a unique experience each and every ride. experience with a train was having The Little Engine that Could read to us by our parents, or seeing a locomotive pass by our car or house for the first time. To enhance the experience for children, Steam into History offers fun opportunities throughout the year, from rides with the Easter Bunny and Santa Claus to tea parties and superhero excursions.